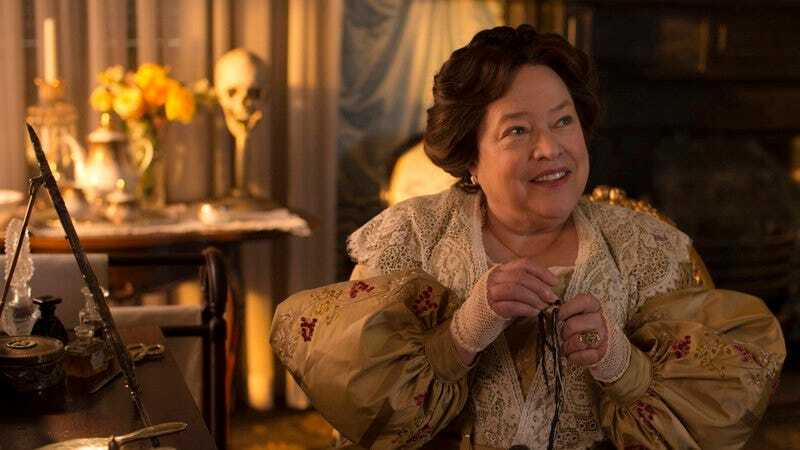 Ryan Murphy has confirmed that Kathy Bates will be returning to his and Brad Falchuk’s anthology series American Horror Story for its fifth season, AHS: Hotel. Chloë Sevigny and Wes Bentley will also return to the dysfunctional AHS family, and Matt Bomer and Cheyenne Jackson will join the cast. Much more confusingly, Lady Gaga is also set to co-star in Hotel. But although Bates was one of the best parts of AHS: Coven, even securing an Emmy for the performance, this casting news won’t make us forget that this will be the first chapter of the series to not star The Supreme herself, Jessica Lange. Murphy and Falchuk are trying their best to replace the massive hole left by Lange’s departure, but it’s doubtful that even a superstar lineup like this will make up for a Lange-less season. AHS without Lange is like a coven without a Supreme, or a freak show without a ringleader, or an insane asylum without a nun with a closet full of canes, and so on. You get it. Still, Bates’s presence means AHS will continue to have one of the most talented casts on television, no matter how disastrous this next season ends up being. Let’s just hope that accent she used in Freak Show won’t be returning with her.